The Secondary Color is used by some tools for effects such as blending. You can click within the Secondary Color swatch and drag to any point on the canvas or interface, to select the color at that point. By default, colors picked from the canvas are the pure colors unaffected by lights and materials. To pick shaded/material colors, hold the Alt key while dragging. You can also use Preferences:Tablet:Color Gradient to blend between your secondary and primary colors while PolyPainting. In this color selector, hues are presented in the outside rim, and shadings and intensities are presented in the center. Here you can first select a hue, then make finer adjustments by clicking in the center. As with the other pickers, you also click within this area and drag to any point on the canvas or interface, and select the color at that point. By default, colors picked from the canvas are the pure colors unaffected by lights and materials. To pick shaded/material colors, hold the Alt key while dragging. Additionally, you can press the C key at any time, and ZBrush will pick the canvas or interface color underneath the cursor. The FillObject button assigns a color and/or material to an object in a Transform or Edit mode. When transforming or editing an untextured 3D object, you’ll notice that each time you pick a new color or material, the whole object changes to the new selection. Press the FillObject button to assign the current color/material to the object. FillObject is regulated by the MRGB, RGB and M buttons in the Draw palette: if MRGB is pressed, both color and material are assigned; if RGB is pressed, only color is assigned; if M is pressed, only material is assigned. The FillLayer button fills the entire layer with the current color and material, deleting everything else on the layer. If a texture is first selected, the texture is used instead of the current color, and it is stretched to fit the dimensions of the canvas. This button is also affected by the Clear Depth button in the Texture palette. It is identical to the Fill button in the Layer palette. 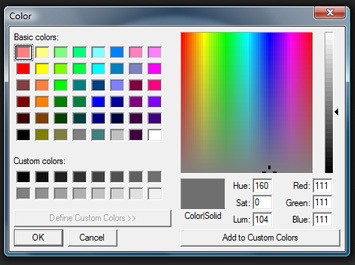 The System Palette button enables you to choose a color using your system’s color picker. The Clear button deletes everything from the selected document layer.